Education Minister to order books for benefit of out-of-state visitors to village. Minister Vinod Tawde felicitates a member of the Book Village project in Bhilar. Mumbai: The book village of Bhilar, Satara district, will soon get as many as 25,000 books in languages other than Marathi for the benefit of out-of-state visitors who drop in at the village. State education minister Vinod Tawde made this announcement. “People from all over the state are coming to visit ‘Pustakache Gaav’ and we will add another 25,000 books in English, Hindi and Gujarati after the monsoon season to cater to them. The ratio for books that we have in mind is 65:35, where 65 per cent books will be in Marathi, while 35 per cent books will be in other languages,” Mr Tawde, who is also minister of Marathi language department and cultural affairs, added. The Pustakache Gaav (Book Village) was inaugurated on May 6. 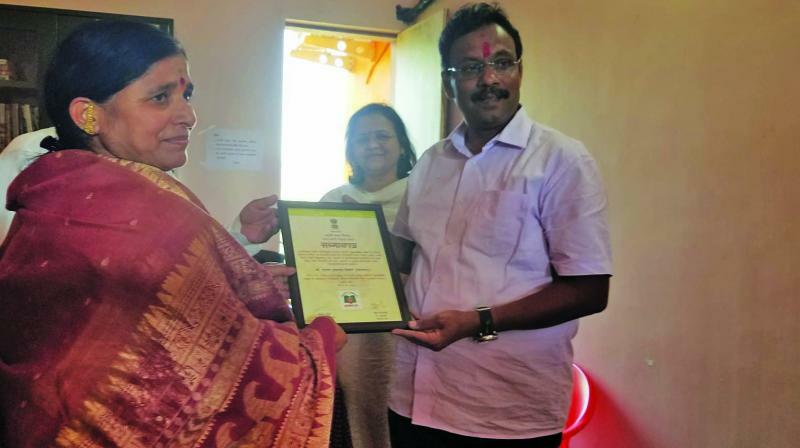 On his second visit to Bhilar on May 18 after the inauguration, Mr Tawde presented each member of the Book Village project with a certificate and noted the response of the visitors to the village. The books village plans to make the necessary changes after taking into account the response of the visitors. The response shown by the tourists in the first two weeks has been overwhelming and the decision to include multilingual books was taken to cater people coming from different states as well. Mr Tawde also plans to develop Bhilar, situated six kilometres from Panchgani, as a cultural and literary hub. project is still underway as the locals of that village are yet to cooperate with the management. The source claimed that after the formalities with the locals are completed, the plan could be taken forward to set up a second book village.